The Southern Sportive cycling events company have nine sportives dotted across southern England in 2014. 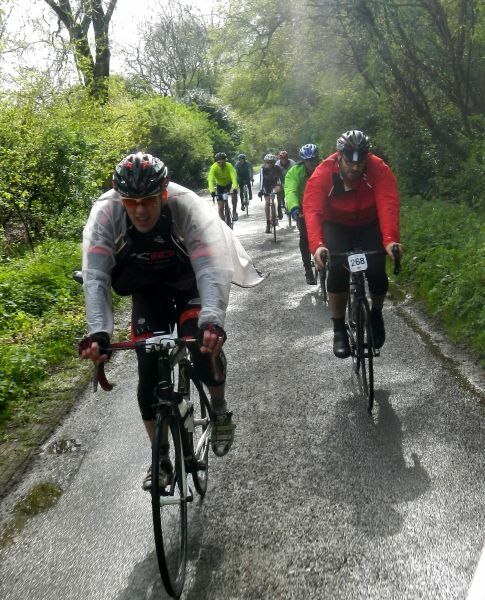 I went along to number four, the St George's Sportive, Princess Riseborough on Sunday 27th April. The route explores the Chiltern Hills west of the town and goes over towards Henley and Marlow with 135km, 110km and 74km route options. Arriving by car I found signs in the town directing me to the start HQ in a local school. Marshals directed traffic in the school's grounds and further signs showed the way to registration and the start gate. There were plenty of helpers on the registration desk to supply my number and a route map without a wait, and there was even hot food available via the school canteen, as well as a stall selling bike bits. A nice touch were the rugs and gym mats laid down over the smooth school floors which meant cyclists wearing cleats weren't skittering around on the otherwise slippy surface. The mats had a second job too: protecting the school from all the wet riders. It was raining hard. The start gate was around the back of the school where a timing mat had been set up under orange pergolas. Here a marshal with a microphone was setting people off in groups. A neat idea was having the usual safety messages broadcast over the PA on a tape loop; this meant the marshal could focus on interacting with the cyclists. Due to building work at the school, getting to the start gate involved two sets of steps. I'm sure by next year a more straightforward, flat roll over to the start will be available. The whole arrival, registration and start procedure was clear and seamless though. 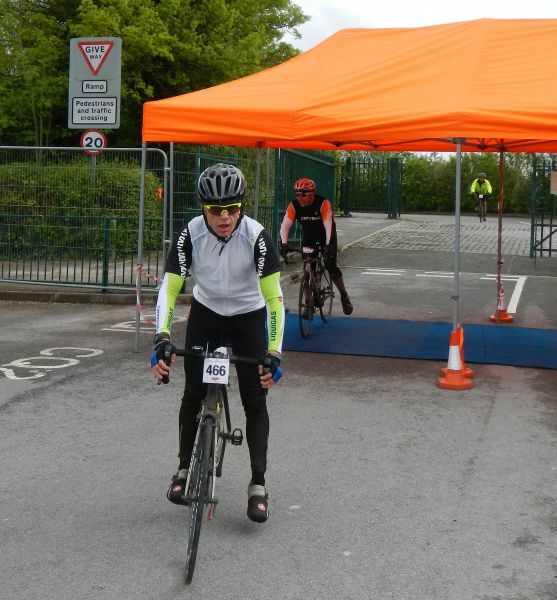 It gave you confidence that you were on a very well organised sportive. We set off in rain. One advantage of the soggy conditions is that everyone has something to talk about and there was a sense of camaraderie. My first chat began in the start house. The route took us quickly out of Princess Riseborough and into the soggy Chiltern countryside. Soon we were warming up on Wigan's Lane before dropping to Chinnor, taking a loop through the flattish countryside and then turning back towards the Chiltern ridge and confronting Kingstone Hill. This is the hill with the tall radio mast on the top that you can see from the M40. On this day cloud and drizzle made the tower look impossibly far away. People around me were busy making contingency plans with their friends, "Wait for me at the top" or "Just go and I'll catch you up later, don't get cold, this will take me sometime." Kingstone starts very easy and hides all of its real slopes in woods. It's No.122 in Simon Warren's "Another 100 Greatest Climbs". 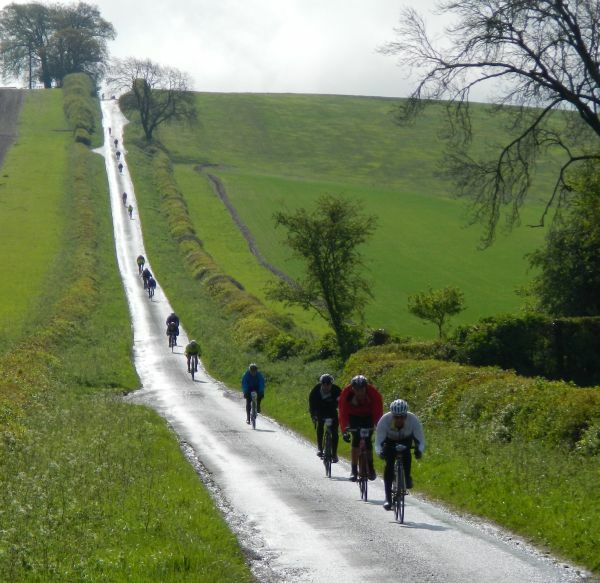 It's a long hill which gradually steepens and can still defeat cyclists when they are almost at the top. A good flat ride over Christmas Common followed and then a fast descent via the arrow straight Britwell Hill took us back down into the Oxfordshire plain and out on a much bigger loop. The sun even came out. 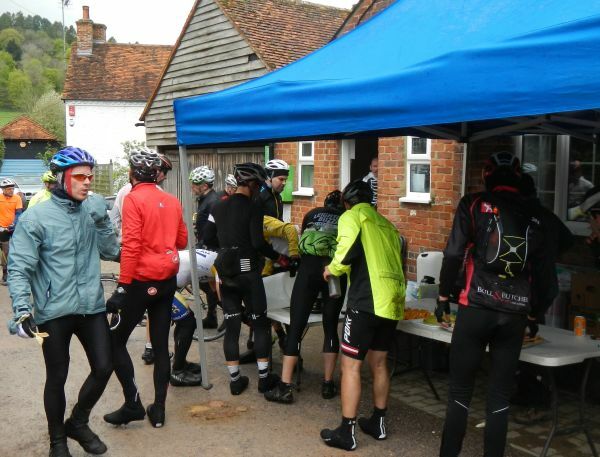 Eventually we came around to the first food stop outside a village hall. Food provision was "real" - bananas, flap-jack, fig rolls plus water and energy powder. The stop was also a checkpoint where you rolled your bike over a mat to record an intermediate time. In one way this was very impressive, I can't think of another UK sportive where you get intermediate timing points, but probably because of this uniqueness it needed to be flagged up a bit more. The marshals were having to remind people to go over the mat, and also shouting after people who weren't stopping for food - they had to come in anyway so they could roll over the mat. Further flat lands took us back towards the Chilterns but this time we were skirting their western end as we headed in the general direction of Henley. Nothing over this way was quite as challenging as Kingstone. On a personal note however I was starting to have a bad time. The relatively easy rises and short climbs were a struggle, and my legs felt like concrete. Soon I was jettisoning my plan to do the full route and reaching for the supplied route map. 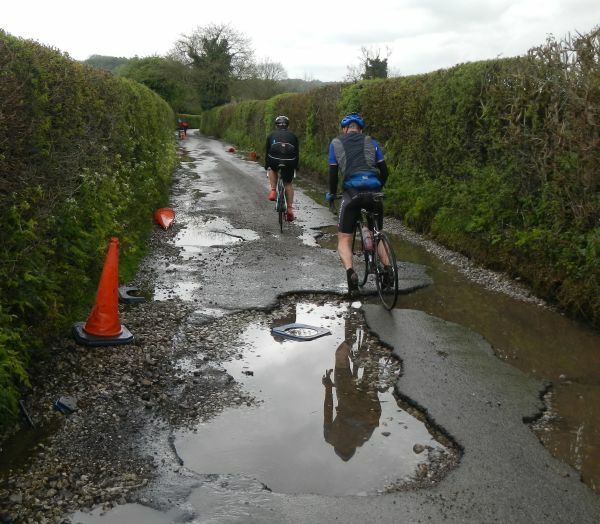 Southern Sportives had warned us that the hills were relentless.. I was in luck as the full and mid-routes split up ahead. The full route took people on a loop through Stoke Row whilst the mids went straight on. The full route rejoined us soon but would do another longer loop heading towards Marlow later on. We took a gentle but long climb back up through the centre of the Chilterns before dropping down to Fingest and turning left for the second food stop in Skirmett. There was similar provision to the first food stop and another mini-timing mat. The full route riders were directed left out of this food stop, whilst the mids and shorts retraced their wheel tracks back to Fingest. The timing mat was placed to the left of the entrance - ideal for the full route riders as they could roll over it and be on their 135km way. I wasn't sure if I should go over it now I had plumped for the mid route, but a marshal assured me it could all be sorted out at the end. Somewhere around Fingest there was an incredibly broken up bit of road which luckily was on the flat. 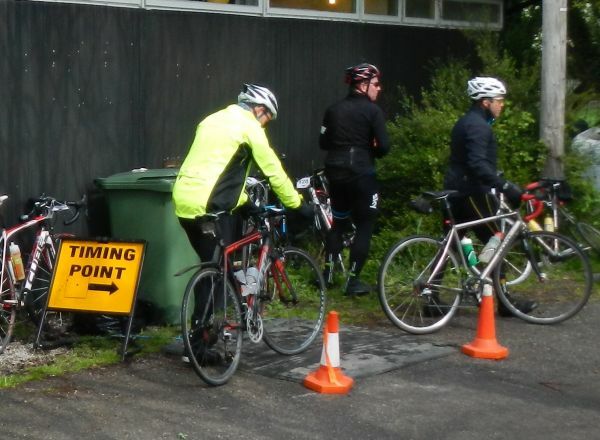 Southern Sportive had put out plenty of signs and bollards, but you had to unclip and scooter over one chasm! From the food stop the full route people went towards Marlow, turning just before the town to climb what looked like a nasty little steep hill. Meanwhile the mids and shorts toiled up Fingest Lane which is long, and 15% towards its weary end. From here we dropped again, this time underneath the M40, and then turned sharp left just before West Wycombe. By now the second food stop refuelling was kicking in, and along with some "we're on the last bit" motivation it almost overcame the pain and suffering. There was a climb back up onto Bledlow Ridge (we had been here right at the start), a drop to a main road and then a final climb that came out on Peter's Lane just above Whiteleaf. We turned left rather than descending that particular hill, but I still managed 70kp/h on the drop down to the school and the start/finish timing mat. There are a few things I haven't mentioned. The signs were excellent - lots of them and little fluorescent ribbons after each turn to confirm that you were on the right course: really helpful and confidence inspiring. Friendliness - lots a chats with people going around, most seemed to be on their first sportive and there was a noticeable absence of large, fast moving packs. The Southern Sportive website is excellent, with lots of information about the routes and what is provided. Individual times and photos went up quickly afterwards, too. It's also worth pointing out the price - just Â£21 for the full route which is very good compared to the current trend towards Â£30+. Overall, an impressively well organised event.